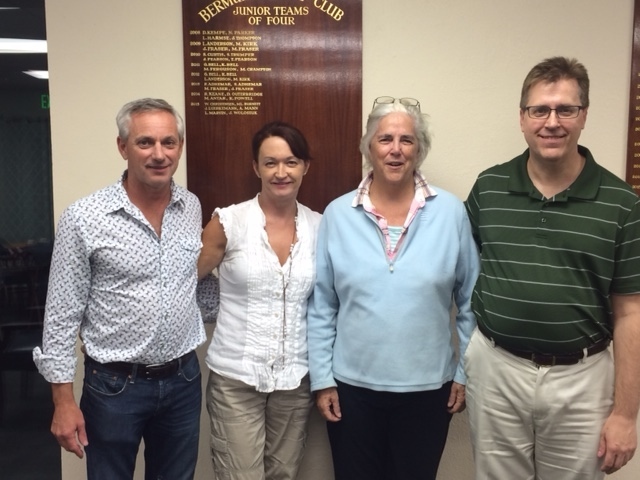 Congratulations to the team of Lane Martin, John Luebkermann, Sharon Shanahan and Claude Guay for winning the 2016 Junior Teams Championship. Four teams took part over the two sessions - the winners started with a bang with their first match and then led the field​ for the rest of the competition​. Well done to them and to all competitors for a pleasant and friendly event. Congratulations to David Sykes and Charles Hall on winning the Open Pairs title for 2016 with a 61.5% game, just ahead of first round leaders John Burville and David Cordon who closed out at 60%.